Step 1: Build an audience. When I look at our industry I see a majority trying to completely skip step #1. Often they don’t even realize it. Many breeders are trying to skip both steps. I’ve never shared traffic info from my site. Honestly for years it was abysmal. I would religiously update my website’s incubator page, knowing that I would be the only one viewing it. I was excited with my first double and triple digit traffic counts. 10 hits a month was a big deal! 100 seemed huge! But it meant that people were looking, I just had to give them a reason to keep coming back. In 2008 my best friend from out of state visited for a week. Adam, from my infamous teenage snake room video. 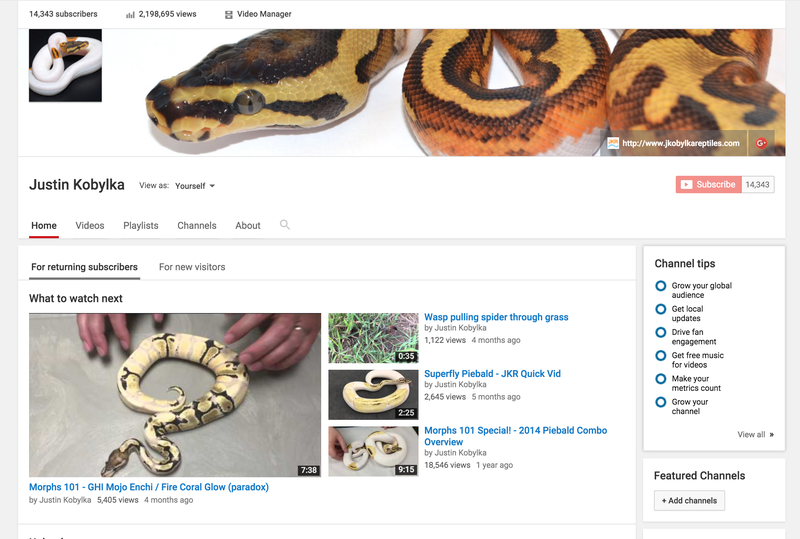 He checked out my tiny Ball Python collection and said “Hey you need to do a YouTube video!” I had no idea how big of a deal YouTube would become, but he held the camera for my first video. That got a total of about 10 views in the first year and 5 of them were probably my mother. These were the Myspace days… you just couldn’t easily get content in front of eye balls back then. He visited again almost a year later and convinced me to shoot a bunch of morph videos… As I started to get views I coined the Morphs 101 and Pro-Tips series. Was I a “pro” back then? Maybe. 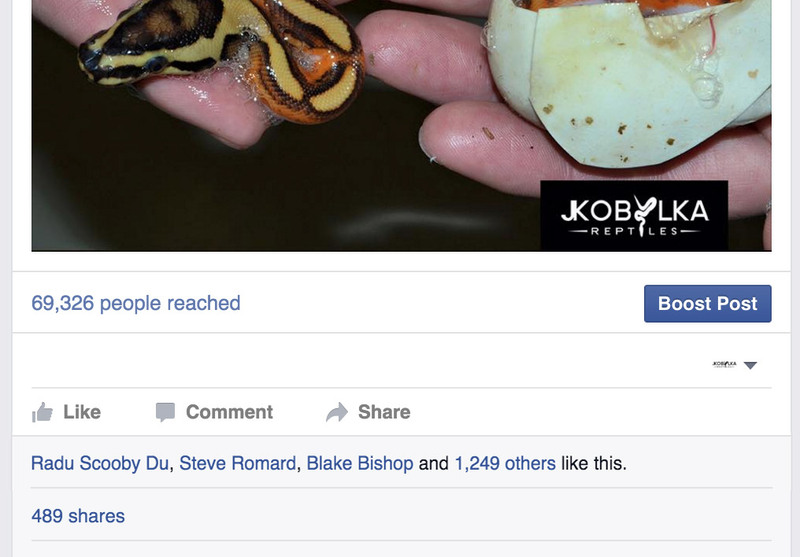 Not compared to the experience I have now, but I was passionate about Ball Python and couldn’t help but share, even if few people watched. Social media is a great way put your message in front of people’s eyes. Its a huge boost from the days of gathering addresses, mailing out price lists and waiting for the phone to ring. More recently were the days of hundreds of Kingsnake.com adds to scroll through. Now your message can be put directly onto your friends and fans timelines. They don’t even have to click! Just scroll… As a result many breeders have abandoned or shuttered their websites and focused on Facebook pages. The dark side of marketing on social media is Facebook & other social media make businesses feel like they have a ready-to-go following. Its a false sense, because these sites are developing into a wasteland of marketing saturation. How much marketing milage are you really getting? Because its really easy for you to get your message out, its also easy for everyone else to do so. Your followers are always one finger swipe or mouse wheel scroll from moving from your content to your competitor’s. Its a tough revelation to understand that your “followers” are following dozens, if not hundreds, of other people and pages, all competing for time and attention. Collecting page “Likes” is a fun challenge until you realize they are not really yours. Facebook owns this gateway to your followers and charges to show your content to the majority of them. The marketing challenge of today’s internet is to pull people off Facebook world and into your world. Can you make potential customers care enough to visit your website, your YouTube channel, your blog? A genuine audience are people who will seek you out because they care about what you are doing. Can you grasp their attention long enough to teach them something about you and your business? In Jan 2014 I decided I needed a better way to share content, and decided to blog. I didn’t want it to be a part of my website because it wouldn’t be about sales. I wanted to make it about connecting with people and building a genuine audience. I also wanted it to be a big Facebook magnet and bring people to a place where if they scrolled down, every post would be mine. That way they they could learn about Ball Pythons & J. Kobylka Reptiles without their awesome friends distracting them. If the content was valuable enough, they would keep coming back. In its first 12 months The Ball Street Journal was viewed 126,000 times, surpassing my best website traffic in the first 6 months. 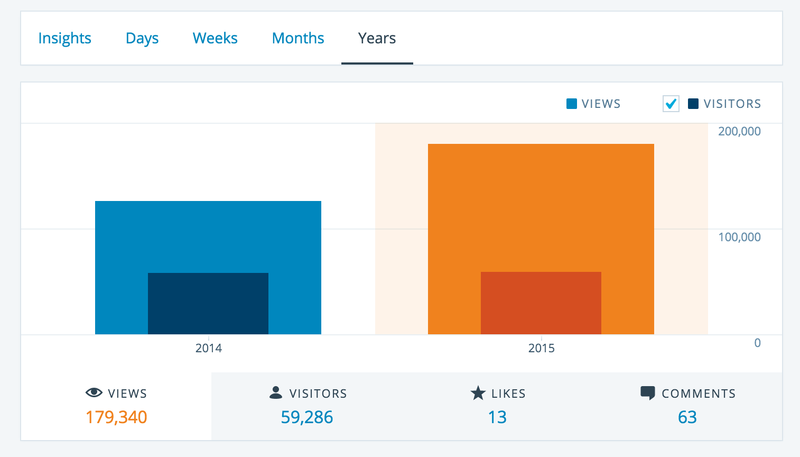 In 2015 the blog is on track to hit 200,000 views (tell your friends). This is organic support, I’m not paying anyone for advertising. My YouTube videos (which I’ve horribly neglected since the blog started) have now been watched nearly 2.2 million times. I don’t tell any of this to brag. To me its humbling because I have to admit that so many of my early efforts were me basically talking to myself. So how will you build an audience? Do you have to make videos or write manifestos? Not necessarily. Everybody has a different skill set that they bring and its your angle that will make you unique. Social media has made connecting both dramatically easier and harder. Its easy to be seen, but in a world where everyone has a megaphone, its very hard to be heard. As you find your voice, there’s one element that is priceless. You have to make quality animals. Animals that cannot be ignored. No amount of “look at me!” will give you a lasting customer base if the animals don’t bare out your hype. 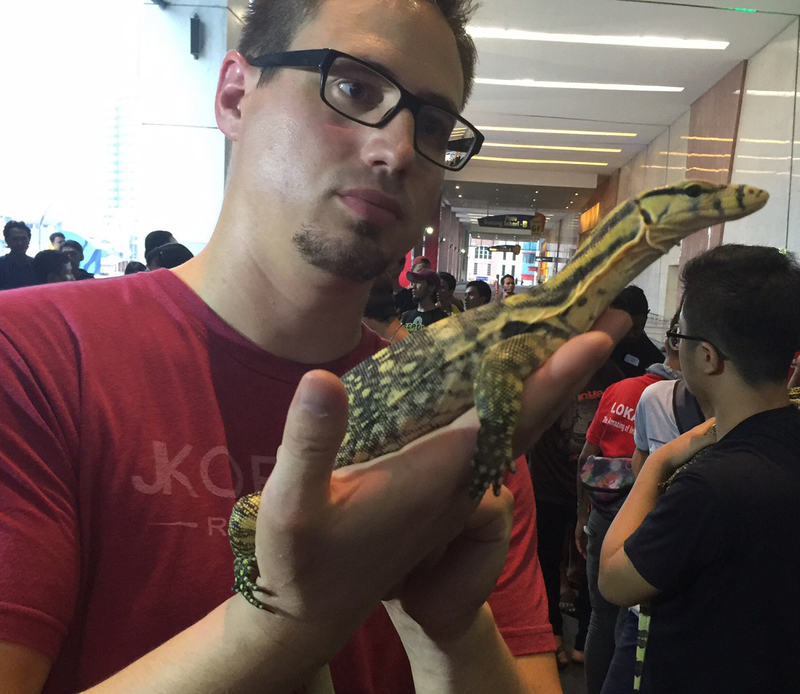 I’m not just talking about world-first animals… but let’s talk about world-firsts. They are not all created equal. Some can really put you on the map, because they move the needle. If you can put up an animal that makes people go to their snake rooms and change their pairings, you’re doing something REALLY RIGHT. Ben Renick did that for me when he produced the first Spotnose Clown. That same evening I had Spotnose males breeding Clown females. I was pleased to buy that first female from him too because he majorly earned props and changed my trajectory. RDR made Dreamsicles – INSANE! The first Pastel Clowns ROCKED the BP stratosphere, as did the Coral Glow Pieds… these are the animals that cannot be ignored. 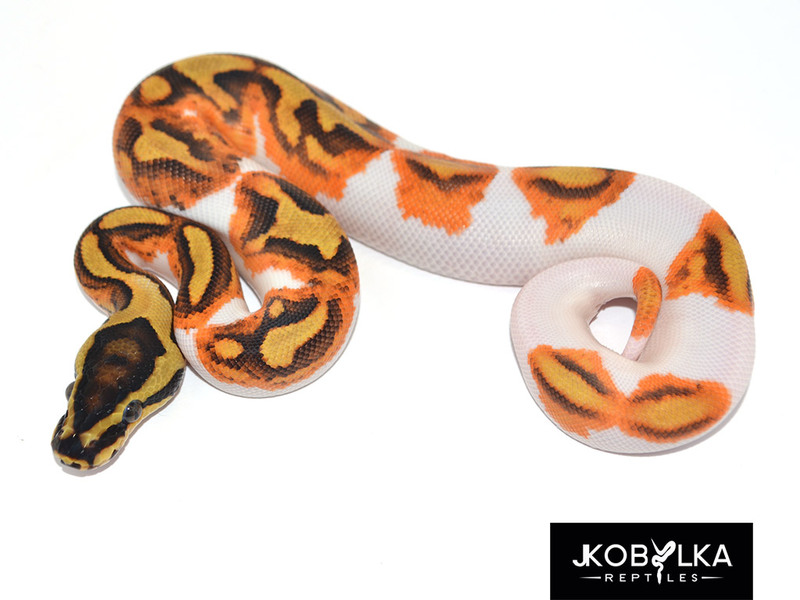 I could list dozens of them and give nearly every big breeder shout out, but they know who they are, These are world first combos that are worth 100 incremental ones. Specializing is another pre-build form of marketing. Be known for doing one thing very well – a signature project. When somebody wants that thing, they think of you because you are pioneering it and you’ve done the work to selectively breed for the highest quality. Doing a lot of things moderately well is a good way to blend into the crowd when someone needs something. If there is one thing you take from this part about marketing, I hope it is this. So you’ve built an audience, you have people paying attention, people think of you when they want something special… what then? Sell to them. Responsibly. Take good care of them. Do it again and again. That will be the next part of the manifesto. December 7, 2015 in Articles. ← JKR Interview from Tinley Park NARBC! What a great guide and I commend you for being so transparent in your findings! You have made it, sir! That’s what this shows right off the board! Can’t wait to read the next part of your manifesto. It’s always insightful to get to see things from the perspective of someone who’s “made it” in their dream-job; or at least in my dream-job, hah.